Batroun (البترون‎ al-Batrun in Arabic) is a small coastal city in northern Lebanon, located 50km northwest of Beirut. The city has been settled at least since Phoenician times; a remnant of that era is the large, 225m long Phoenician wall along the coast. 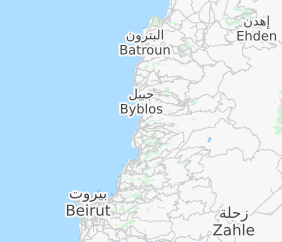 In Greek times Batroun was called Botrys. In 551 AD a large earthquake destroyed the city and created the large natural harbour. Batroun is not as famous as Byblos or other UNESCO sites in Lebanon, but has an attractive historic core with many old buildings and several churches. It is a major tourist centre with many hotels and restaurants. Besides the Phoenician wall, among the sights are the picturesque Our Lady of the Sea (Sadiyat al-Bahr) Greek Orthodox church. Overlooking the harbour is the St Stephen's Christian Maronite Cathedral, which was completed in 1860. 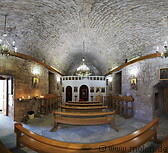 The Our Lady of Nourieh monastery is a 17th century Greek Orthodox Marian shrine located 6km north of Batroun on a 287m high cape overlooking the Mediterranean sea. Batroun can be reached by car (50 km, about 50 minutes), bus or shared taxi from Beirut. It can be easily visited as a daytrip from Beirut. There are a number of hotels in Batroun, mostly of the mid-range resort type. The city is popular with tourists.